This is unreal and personally I can't really believe this. 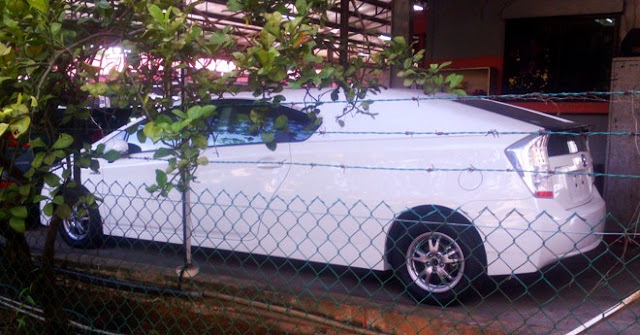 Toyota never produce a Limo version for their Toyota Prius but a dealer from Singapore has successfully "stretch" the Toyota Prius hybrid car to a longer version aka Limousine version. I am not a photoshop expert but based on the pictures, this is not edited by photoshop. Anyway there is still a doubt of stretching the Toyota Prius, will this affect the entire structure of the car? I will leave this to you to judge about it. The picture below shows a standard version of the Prius which is the best-selling hybrid model in the world, with over a million sold since the model line was launched in 1997. Continue to read more for more pictures of this Limousine version Toyota Prius. The original version of Toyota Prius.